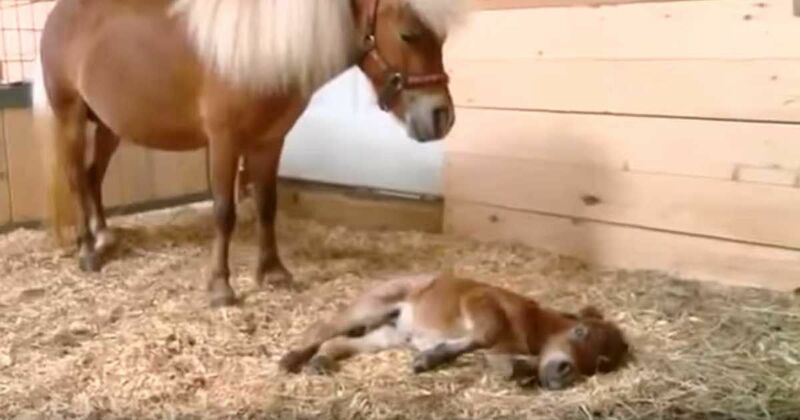 Miniature horses are small by nature, but this tiny foal takes miniature to a new level. Itty Bitty Hope tied the record for smallest horse ever born at only 14 inches tall in June 2015, according to News Channel 4. As seen in the video below, the tiny horse is small enough to be cradled like an infant. Her owners, Linda and Jim Woods say that Bitty Hope is not likely to get any larger than 25 inches tall, according to Country Living. Though she's tiny, the Woods are training Itty Bitty Hope to help in a big way. When she's older, Itty Bitty Hope will work as a therapy horse for at Mini Hooves of Love. The program uses miniature horses to provide therapeutic visits for children, the elderly and other individuals who could benefit from pet therapy, according to its website. Mini Hooves of Love is a nonprofit organization. The Woods say that interacting with the pets can be therapeutic and comforting for people, especially the elderly. "One man who had been a farmer had tears in his eyes as he pet one of the horses. He said he hadn't touched a horse in 16 years," Linda said according to Country Living. Training for a therapy horse includes learning to navigate different surfaces (including tile, wood and carpet), learning to interact with other animals and playing with children, according to Country Living. Because of Itty Bitty Hope's small size, the Woods say she may be able to visit more places than the larger ponies, according to Country Living. Coconut the little paint foal is only 2 days old and getting her first outside playtime. While coming back from a hike, Jeff Molyneaux had to stop at the sight he was witnessing. This is definitely an adorable duo.